The Northern Inuit Dogs of HBO's "Game of Thrones"
The Northern Inuit dog breed is very much in demand, thanks to its starring role in the HBO blockbuster fantasy series “Game of Thrones.” Here's what you need to know if you're a dog breeder or considering getting one of these magnificent canines as a pet owner. The Northern Inuit, which resembles a cross between a German Sheperd and malamute, is a relatively new dog breed established in the 1980s by U.K. breeder Edwina “Eddie” Harrison. Often mistaken as a wolf hybrid, the Northern Inuit caused quite an uproar in Britain when initially advertised as belonging to the aggressive wolf family. Dog experts say these dogs are a mix of several rescue dogs of unknown origins, along with the Alaskan malamute, German Shepherd, and Siberian husky. The result is a dog breed not only exquisitely beautiful but canines with great temperaments that make wonderful pets—provided that they are adopted by the right people. This dog breed is friendly, affectionate and loyal and is a great family dog. Northern Inuits are good with kids. Unlike other breeds like Rottweilers, they are docile. The breed gets along well with other pets, especially other dogs. They are intelligent and easily trained, particularly as pups. These dogs are prone to extreme separation anxiety and are a poor choice for those who spend long hours away from home. Although docile, Northern Inuits tend to be highly rambunctious. They are inveterate diggers and are not a good choice for people with prized gardens or lawns. Like many large breeds, Northern Inuits are prone to hip dysplasia, and the process of hip scoring is recommended to determine the condition of a dog’s hips. While this X-ray technique is no guarantee that future generations won’t suffer, the procedure should be performed before breeding to rule out possible health risks. Northern Inuits are prone to sensitive stomachs. Experts such as the Honiahaka Northern Inuits recommend a raw food diet or, at the very least, premium natural dog food products. In the HBO series “Game of Thrones" (based on the first of an epic series of books “A Song of Ice and Fire” by George R.R. Martin), Northern Inuits are fictional animals called “direwolves." 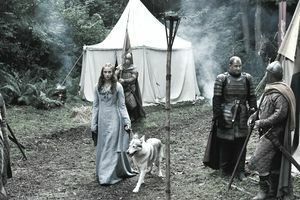 The "direwolves" are adopted as pups by the children of a nobleman after he and his cronies find them in a forest moping around their dead mom, who was killed by a deer. Initially, the producers wanted to use real wolves but decided it was too dangerous. The Northern Inuit was chosen because they resemblance wolves and have the adorable “aw!” factor required for the show. The public has so fallen in love with these amazing canines that there has been a heightened interest in their adoption. Those in the pet industry are well-advised to do their homework to ensure these dogs are properly bred and cared for. Although I encourage people to prioritize adoption when acquiring pets, it’s important to note these dogs are available as rescues. For anyone interested in the Northern Inuit, the highly-respected Northern Inuit Society is a good resource. The society insists that any member of a dog breed classified as Northern Inuit be registered with the organization because it's the only governing body for pure members of the breed. Those considering breeding these dogs are well-advised to peruse and honor the society’s Breeders Code of Ethics.